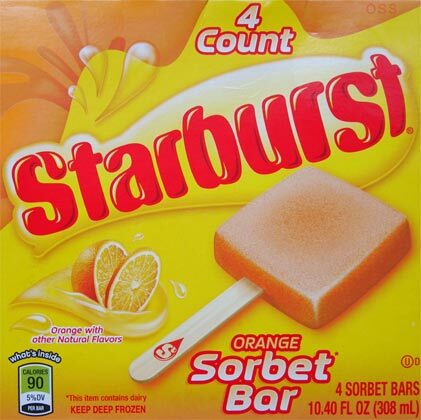 [New for 2015, Discontinued] It seemed only natural that in time, 2014's strawberry Starburst sorbet bar would get some differently flavored company on the shelf. HA! I love the wrapper! Simple, colorful, effect. Whoa, that was weird, there's a very strange funk to this bar. It's bright, and it definitely reminds me of orange Starburst, but there's a out of whack potent cream feeling to it. I'm not sure how to describe.... but it's not good. I kind of feel like I'm trying to eat orange rinds. Oh, wow, that bite was worse. That milky/creamy vibe that worked in the strawberry is not working here at all. It's orange creamsicle with a weird kick. I'm only half way through and I'm already forcing myself to take the next bite. I had really been looking forward to these, but wow, yeah, no, these don't even get a partial recommendation. It's like a mouth for of cleaning chemicals. This one will be hard to second scoop (or it'll be a one bite second scoop). Not a fan of sorbet in general, so I know this wouldn't do it for me even if it tasted spectacular. I don't get it that sorbet is supposed to be dairy free. They added milk in there. If without the milk it might be more refreshing. Why the hell do they call it a sorbet bar if it contains dairy? Call it a sherbet bar. Sorbet = no dairy. Sherbet = dairy. Geez. Bahahahahaha, I've asked myself the same thing and even mentioned as such when reviewing the strawberry version. This really does look awful. Completely amateur. Almost as if a Kindergarten class made them during a cooking activity. Perhaps that's what they were going for. Sounds like it tastes like it was made by children, as well. We bought a box this week because my daughter loves the strawberry ones. There is something VERY wrong with this flavor! They are awful! Do you think that they taste tested them? I agree... I bought a box out of curiosity, and the orange flavor is not right; it's an odd, and unappealing flavor -- What a disappointment! I'm a fan! Tastes like orange push pops! It is almost....salty? My daughter and I just tried them. No.